Our recently arrived Americorps intern Wieteke Holthuijzen is now leading this effort and doing a great job. We are interested in doing more phenology monitoring in the future, which might include more invasive plants and possibly also to guide native plant restoration efforts (e.g., informing seed collection). As we discussed a few weeks back, we will be putting together a list of plant species to propose for inclusion in Natures Notebook. What is the average amount of time between emergence and ripe fruits of the invasive species golden crownbeard, Verbesina encelioides? This will help the Refuge to better time their removal activities. 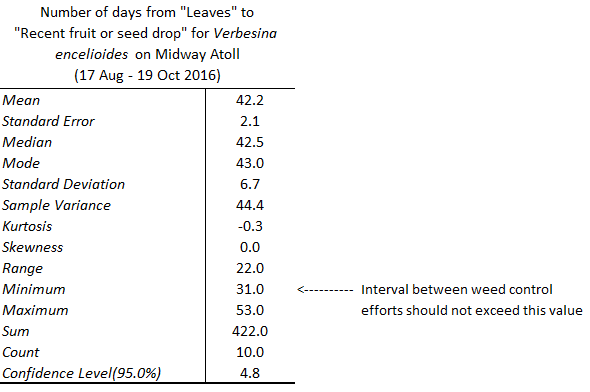 The verbesina plants we have been monitoring have generated sufficient data to estimate the number of days required for this invasive plant to go to seed (see table below). This information is being used to guide weed treatment on the refuge, specifically, the minimum number of days it takes for the plant to go to seed is being used as the maximum time between visits to sites by the weed control technicians. Because we believe verbesina plants grow and flower at different rates across the year (and there is no season when they are completely dormant), the plan is to continue monitoring throughout the year so that control schedules can be adjusted accordingly. We are also keen to learn more about how to put the data visualization tools to use as currently, we are exporting data and doing our analysis/visualization in MS/Excel.